Our garden is bursting with rhubarb! We have about 6 large rhubarb plants, all of which were in desperate need of splitting earlier this Spring. After splitting them we ended up with about 25 rhubarb plants! Most of them we gave away to friends but se kept a few and transplanted them. That means we’re pretty much set for life with rhubarb galore. 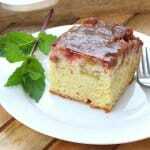 After making jam and compote with the rhubarb I made this cake on a whim. I had 2 pounds of strawberries in the fridge and threw the two together to make this upside-down cake. Topped with whipped cream or served with vanilla ice cream, it’s simply delish! Place the butter in a 8×8 inch square baking dish or round cake pan. Melt it in the oven. Sprinkle the brown sugar evenly over the butter. Place the strawberries evenly over the brown sugar followed by the rhubarb. In a large mixing bowl, beat the eggs, oil, vanilla extract and sugar until combined. Add the sour cream and beat until combined. In a small mixing bowl, combine the flour, baking soda, baking powder and salt. Add the milk and flour mixture, alternating between the two and ending with the flour. Beat just until combined. Pour the batter into the cake pan. In an oven preheated to 350 degrees F, bake for 45-55 minutes or until a toothpick inserted into the center comes out clean. Let the cake sit for 5 minutes then run a knife along the edges and invert the cake onto a plate. If using, pour over the extra caramel glaze and let cool another couple of minutes before serving. 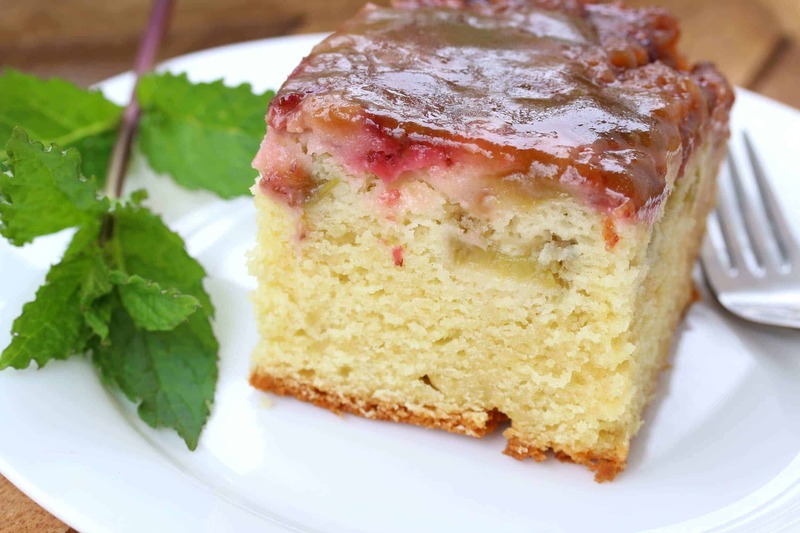 Enjoy the heavenly combination of strawberry and rhubarb with delicious caramel glaze! Preheat the oven to 350 degrees F. Place the pieces of butter in a 8x8 inch baking pan or 9 inch round pan and melt it in the oven. Sprinkle the brown sugar evenly over the melted butter. Evenly place the strawberries over the brown sugar followed by the rhubarb. In a large mixing bowl, add the eggs, sugar, oil and vanilla extract and beat to combine. Add the sour cream and beat until combined. Add the milk and flour mixture, alternating between the two and ending with the flour. Beat just until combined. Place the butter, brown sugar and heavy cream in a small saucepan (you can also microwave the ingredients for a minute). Bring to a boil and simmer for 2 minutes. Remove from heat and let it sit for a minute. Pour the glaze evenly over the cake. Let it cool for a couple of minutes before serving. 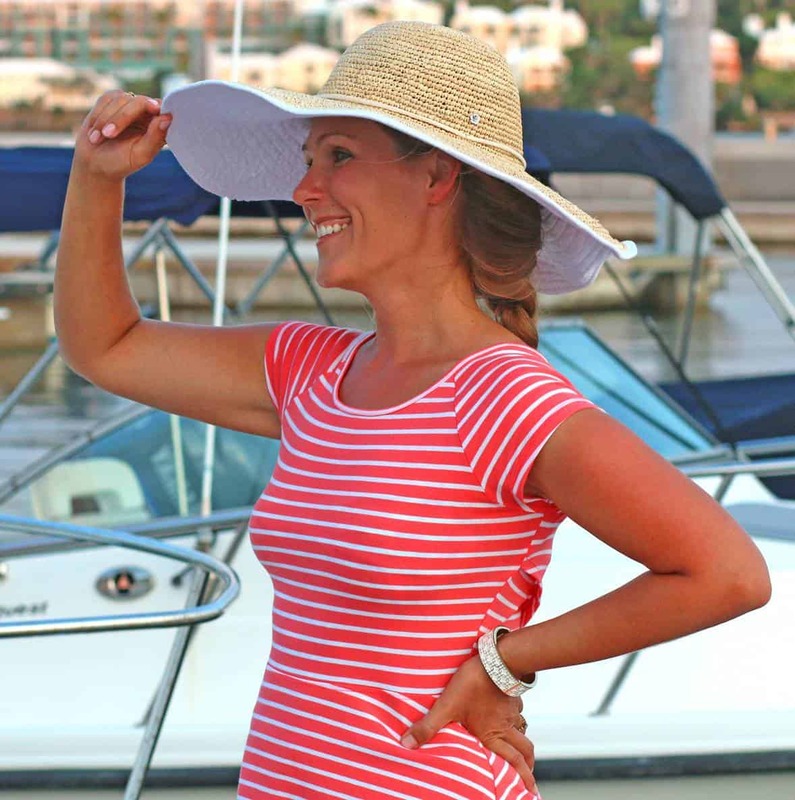 Rhubarb is one of my favorite summer flavors! Can’t wait to try this cake! I’m always intrigued when I see rhubarb used in recipes since I never use it! I think I need to give rhubarb another chance! This cake and topping looks incredible! I wish I had all this yumminess overflowing in MY yard!! All I have is weeds… lol. This cake looks delish, btw. This cake sounds perfect right now! I need to find some rhubarb — soon! What a nice looking cake! I love rhubarb season! It just pairs so well with strawberries! Aww, man. I wish I was your neighbor because we can’t get rhubarb down here easily and I’ve still never had it. And this cake? AMAZING. So good! Strawberry and rhubarb are such a lovely combination. 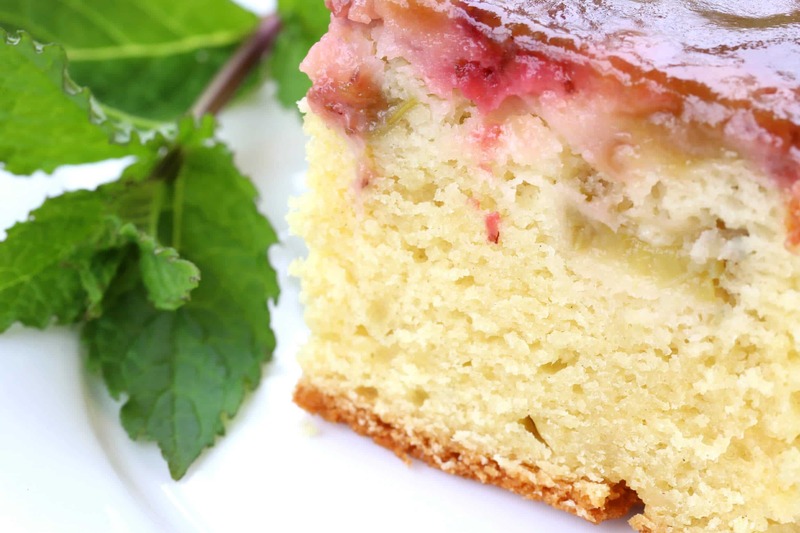 The sweetness of the strawberry pairs so well with the tartness of the rhubarb. What a great idea for an upsidedown cake! This looks great. I love any upside down cakes and yours looks superb! I love strawberry rhubarb anything! What a great idea. This looks dreamy! Going to be making this this Summer for sure! This is a idea for that rhubarb! I’ll bee trying it, for sure. We tried this two days ago, and it was delicious! I mean really, really good! However, note that what to do with the sugar is missing from the recipe directions! Hi Paul and Suzanne, I’m so happy to hear that, thank you! Thanks also for catching that omission, it’s now updated. Can you just check the dimensions on that cake pan.? I made this tonight in an 8″ x 8″ and there was far too much fruit. Consequently it was really soggy. I only made half the amount of cake batter in the end because I wouldn’t have fit it all in! Even in your photo it looks much bigger than an 8″ x 8″. That aside, the flavour was amazing, and despite it all, was more of a pudding than a cake. Definitely make again but would modify the amounts. Also good to arrange the strawberry halves neatly so that they make a nice presentation side. Hi Chris, I’m sorry to hear that happened. Yes, it’s definitely an 8×8 pan. Here’s the one I use: Parrish Magic Line. It’s 8x8x2. Is the pan you used 2 inches deep? Maybe an obvious question, but you did put the fruit in first, correct? That way the cake batter bakes on top and should be soggy at all since the juices of the fruit will remain on the bottom while the cake bakes thoroughly through, then later on the cake is flipped over with the fruit on top. ☺️ Yes I put the fruit in first! My pan is only 2″ deep though so that would account for the volume of cake batter. Your photos of the cake only seem to show a small layer of fruit though compared to the amount you put in. Anyway, it’s different strokes for different folks and you always adapt the recipe to suit your needs. Maybe my strawberries were juicier, my rhubarb a variety with more water? As I said before the flavour was great and the cake light and I’ll be trying it again tomorrow with plums from the garden! I’m so sorry for the frustration, Chris. Yes, that extra inch of pan space would account for it. Plums sound like a delicious version! We have three Italian plum trees in our garden that will be ready in a couple more weeks. This Zwetschgenkuchen (German Plum Cake) is one of my favorite ways to put those to use. Well, happy to say the plum version turned out fantastically. I used a round 10″ pan which was 2″ deep and it is amazing. Just eating a slice now while still warm with a blob of the remaining sour cream. Awesome. I’ve loads more left (Victorias, mine are) to try the Zwetschgenkuchen too. Thanks. That’s sounds delicious with the dollop of sour cream. Thanks for sharing, Chris, and I’m glad the slightly larger pan did the trick! 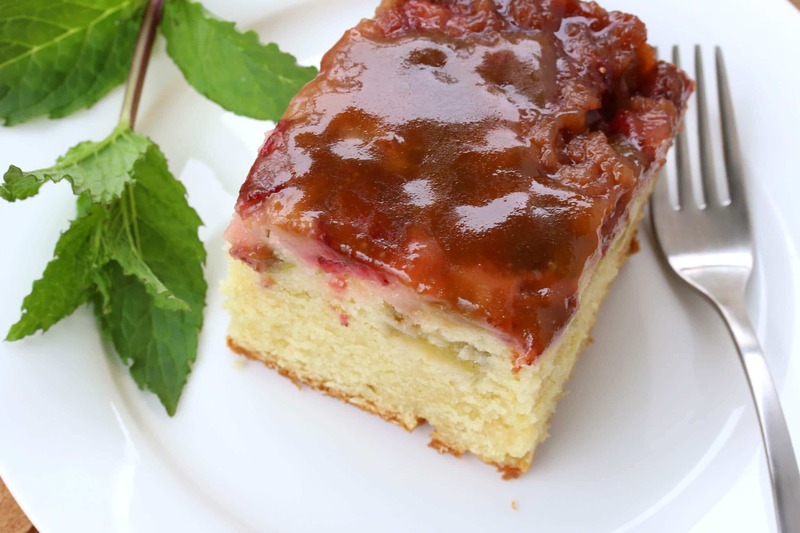 I’ve been making rhubarb upside down cake for many years, ever since I had a piece that was sold at a fund-raiser for the Friends of my local library. Because I love the tartness of rhubarb, I use only rhubarb, no strawberries. Hi Judy, this time of year you should be able to find it in many grocery stores in the produce section or at farmer’s markets. No, it is not poisonous and it can be eaten raw. However, the leaves are poisonous and must be discarded. I made this today and was frankly, disappointed. I followed the recipe exactly. The sides of my cake turned out soggy which I figured would happen when I saw the juices bubbling up the sides while it was baking. Should have dusted the top of the fruit with a little flour first.The overall taste in my opinion was so so. Will stick to your plum cake recipe as that is absolutely to die for.